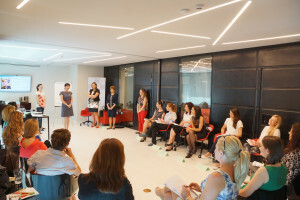 The second edition of the project “Leadership Academy”, initiated by The Council of Women in Business in Bulgaria, is focused on the personal and professional development of the ladies in the middle-level management. Twice as much as the last-year candidates submitted documents for Leadership Academy 2015/2016. 41 ladies have been chosen after a complicated selection process. The youngest candidate this year is a 24-year-old lady running her own business. The average age of the participants is 40 years. Among the candidates there are some with doctoral degrees. The chosen ones in the Leadership Academy 2015/2016 are representatives of different economic sectors- bank, information and communication technologies, trade, consulting services, education, production, construction, tourism, state administration and so on. The main part of them works in Sofia and represents small and medium- size companies but there are also some participants from Plovdiv, Pirdop, Gabrovo, Varna, Lovech, Burgas and Dobrich. The Academy is entirely sponsored by the companies-members of the Council as well as absolutely free for the approved candidates. Throughout the second academic year of the program beside the six training modules there will be extra one-Design thinking. The news is that the companies-members of CWWB will be hosting during the different modules. This measure aims to meet the participants with various businesses. The Leadership Academy represents one-year training from May 2015 until February 2016 in several different day- long sessions, dedicated to the personal and professional growth as well as the soft skills development of the business ladies. Each day-long session will be organized once per month during the workweek. A day-long training whose purpose is self-awareness of personal strengths and weaknesses. Intensive and defiant for the personality, this seminar uncovers the way you can deal with changes via what is called emotional intelligence- acceptance of emotions and comprehension of their probable results. Well-structured training which helps optimizing the most important model of all- you yourself. The participants in the Leadership Academy work with Canvas Model to visualize and analyze their proper business model. The participants learn why feedback is substantial, when they should fill in the forms, how feedback can be constructive and how to manage with the difference of opinions. The module took place in Nestle. The CEO of the company Juan Carlos Peralejo shared some useful experience with the participating ladies. This training is dedicated to the variety of personalities and is related to the human diversity in a company. During the seminar there will be discussions not only about self-knowledge and the acceptance of others but also about the impact of the people’s behavior on the social interactions. This module takes place in the office of SAP. The aim is to reveal and develop creative skills and groundbreaking methods for resolving a problem. The two groups of Leadership Academy unite by reason of an interactive training for team working and collaboration. Mrs. Yordanka Fandakova – mayor of Sofia and member of honor of The Council of Women in Business in Bulgaria will hand in the certificates.